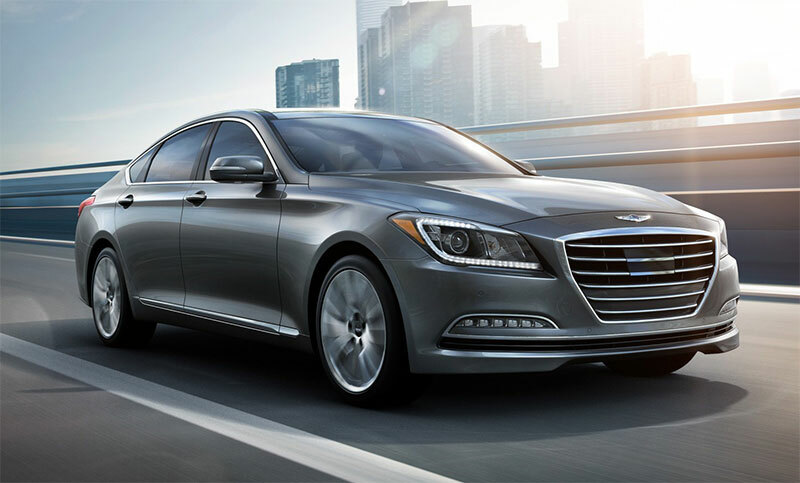 Today Hyundai introduced its all-new 2015 Genesis at the North American International Auto Show in Detroit, marking the highly-anticipated launch of its second-generation premium sedan. The groundbreaking original Genesis model won the prestigious North American Car of the Year accolade at its introduction in 2009. 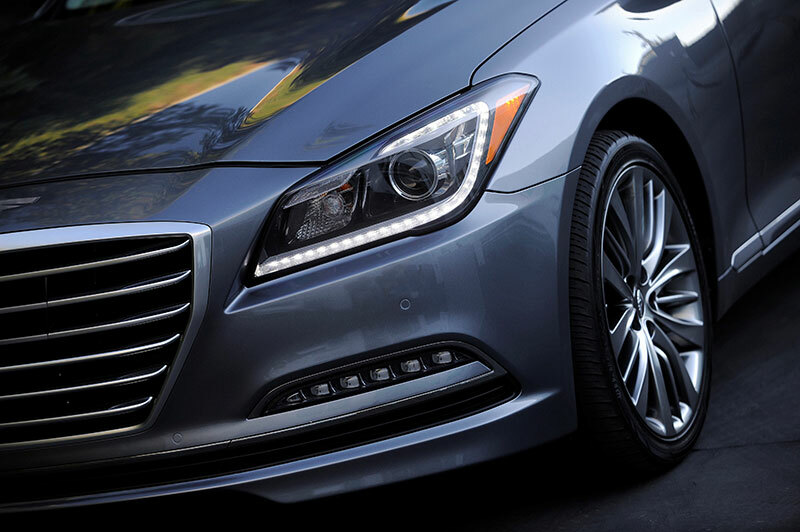 The 2015 Genesis represents a bold step forward for Hyundai, continuing to build upon its successful strategy of marketing its premium models under the Hyundai brand umbrella, rather than a costly separate luxury brand sales channel. The new Genesis is incredibly well-equipped in every configuration, offering even more content than the first-generation Genesis. This additional content includes a generous suite of standard safety and convenience features, unsurpassed in its class. For the first time in a Hyundai sedan, a sophisticated AWD system will be offered, known as HTRAC®, significantly broadening Genesis appeal in Snowbelt regions throughout the U.S. The new Genesis will be built at Hyundai’s Ulsan, Korea plant, with U.S. sales beginning in the spring. Since its 2009 debut on the Sonata sedan, Hyundai’s Fluidic Sculpture design philosophy has been continually enhanced and refined, progressively influencing every model in the Hyundai line-up. The all-new Genesis will be the first Hyundai to embody Fluidic Sculpture 2.0, the second-generation of this convention-shattering design theme. Fluidic Sculpture 2.0 encapsulates a trio of main design elements: fluid aesthetics, the modern Hyundai look, and a premium ambience. Fluidic forms are still present but with a more refined and precise presentation. This latest design philosophy is adaptable to a wider range of vehicle types and sizes, from CUVs to premium-luxury flagships. The all-new Sonata sedan, to debut later this year, will also clearly manifest the Fluidic Sculpture 2.0 design philosophy. The 2015 Hyundai Genesis expresses a truly modern design through distinctive exterior styling with a sleek, upscale appearance. Evoking a premium feel, the design cues display a new Hyundai family aesthetic: simple and harmonious design with refined fluidic elements. The design features the modern Hyundai look, with a striking hexagonal front grille as a key geometric element, a dynamic crease accent running along the flanks of the car, and a dynamic rear design. Design surfaces convey a kinetic elegance, relying more on voluminous body sections than surface details to create dramatic forms. Proportions demonstrate a long dash-to-axle length, longer wheelbase and shorter overhangs than its predecessor. These proportions clearly convey the performance rear-drive configuration beneath the sheetmetal. 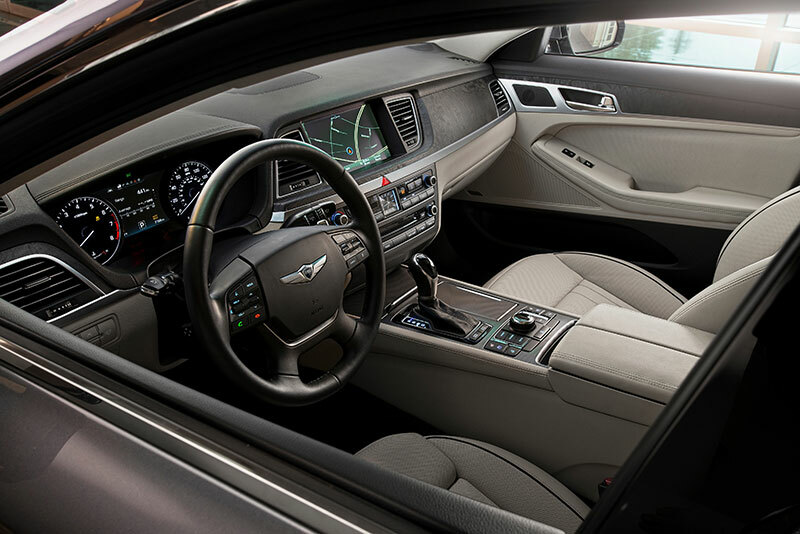 Hyundai interior design principles – safety, intuitiveness and simplicity – guided the Genesis design team in redesigning all primary controls to deliver maximum ease of use. The steering wheel design and grip has been improved and onboard switchgear was redesigned; a number of switches previously found on the center console of the original Genesis were relocated and reshaped on the Genesis. Further ergonomic improvements to ensure ease of reach and control have been meticulously evaluated and executed using a specially-designed laboratory tool created to measure occupant operational force for ergonomics. 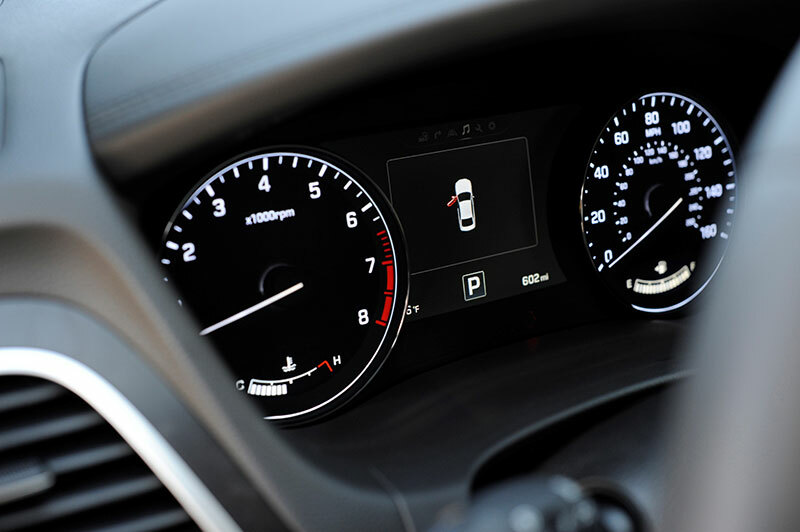 A new design pattern has been introduced to decrease relative interior reflections and brighten dashboard surfaces, while high-grade materials such as genuine aluminum and matte-finish wood are available. Cohesion between the center fascia and audio controls has been ensured through a streamlined design, making the two separate sections appear as one. To ensure a luxurious feel, Genesis was intensely scrutinized for its use of materials, with extensive analysis of the relationship of different materials, their texture and color coordination. In addition to extensive on-the-road and laboratory testing, circuit-based testing of the Genesis took place in Germany, Korea and Hyundai’s California Proving Ground in the U.S. High g-force assessment of the new HTRAC AWD system was completed at the Korea International Circuit in Yeongam, the venue for one round of the Formula One World Championship. Durability and high-performance handling driving tests took place on the Nürburgring Nordschleife circuit in Germany to precisely calibrate Genesis ride, braking and handling characteristics. Furthermore, Hyundai engineers collaborated with top dynamics experts such as Lotus Engineering to further validate the performance capability of the Genesis. To help ensure maximum driver alertness, Genesis also benefits from a world-first technology in its CO2sensor control system, located under the glove box. Hyundai engineers discovered that occupants start to get drowsy when CO2 levels reached more than 2,000 parts per million, so the new ventilation system helps ensure the cabin maintains a CO2 concentration well below that level at all times using freshly-ventilated ambient air. The system monitors the vehicle’s intake of fresh or re-circulated air using a dedicated CO2 sensor. 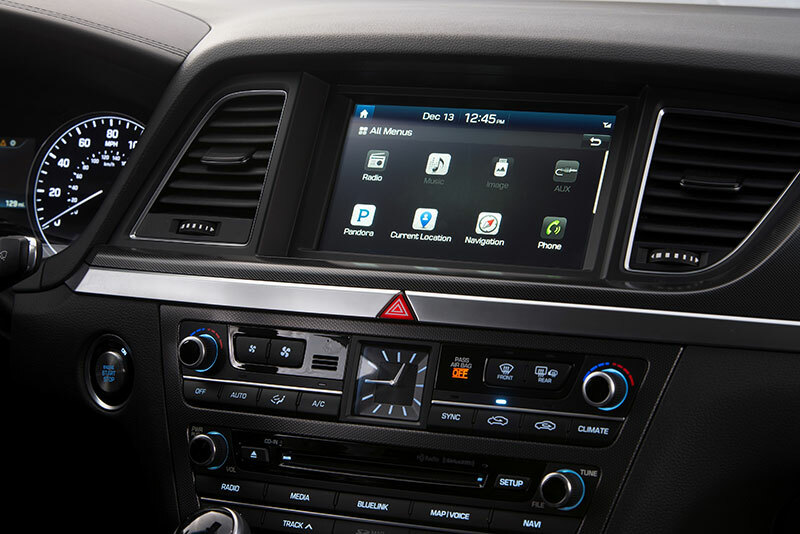 Hyundai’s telematics services program, Assurance Connected Care, is standard on all 2015 Genesis sedans equipped with Blue Link. This innovative ownership program provides Hyundai owners with proactive safety and car care services via the Hyundai Blue Link telematics system. These services include Automatic Collision Notification, Enhanced Roadside Assistance, Automatic Diagnostic Trouble Code Notification, Monthly Vehicle Health Report and in-vehicle Car Care maintenance scheduling. Hyundai also recently introduced an all-new mobile application for the Blue Link telematics platform. This mobile app allows subscribers to remotely access various optional Blue Link features and services through compatible mobile devices. Completely redesigned, the app has been significantly enhanced from the previous version and boasts a new user experience, faster navigation and innovative new features. Google Android and Apple iOS users can download the app from Google Play or Apple iTunes, respectively. Blue Link is an innovative telematics solution that brings seamless connectivity for safety, service and infotainment capabilities and is offered in three packages: Assurance, Essentials and Guidance. More details regarding Hyundai Blue Link are available at www.HyundaiBlueLink.com.